If you follow me on Instagram, you know that I embarked on a Whole 30 journey a few weeks ago, 14 days to be exact. 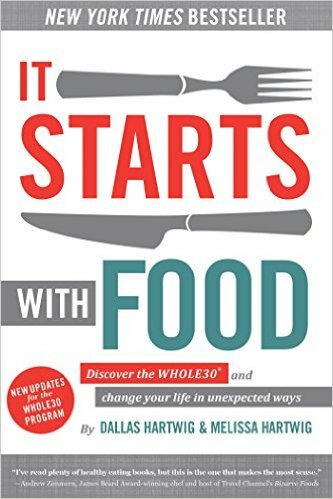 If you aren't familiar with Whole 30, it's an elimination eating progarm (not a diet) where you consume ONLY meat, veggies, fruit, nuts and healthy fats such as olive oil, coconut oil, olives, avocado and nut butters. That means for 30 days (or longer if you choose), you consume absolutely no dairy, no legumes, no grains, no sugar (real or artificial) and NO alcohol. After the 30 days, you slowly reintroduce certain foods back into your diet and assess how your body responds to them both mentally and physically. Yes, it is radical and yes it sounds crazy. I know. For a girl that loves her food and cocktails, I never imagined myself doing something so "restrictive." Let me explain. After Ben was born, I gave myself some time to adjust to life with three kids. I didn't rush myself into dieting or push myself back into the gym. I was no stranger to postpartum weight loss and had lost 25+ pounds after both of my previous pregnancies. I knew how to lose weight and when the time was right, I would march back to Weight Watchers and start counting points and working out again. But this time around, I felt different. There was something more than just losing the baby weight. Ben was four months old and I was still having terrible night sweats, my hair started falling out, my ankle and knee joints were swollen and I was stress eating at every turn. Simply put, I just did not feel healthy. I felt terrible. So, here I am 14 days in and you want to know what I think about the Whole 30? I absolutely love it! Already I feel so much healthier and happier AND I'm conditioning my mind and body to eat really good food. Do I miss certain foods or the occassional margarita? Absolutely, and they'll eventually make their way back into my life. But not for these 30 days. These 30 days are about taking care of me and giving my body what it needs to get back on track to feel good. So, there it is. Why I chose Whole 30 in a nutshell. Tomorrow I'll be recapping my first two weeks on Whole 30 and sharing details like what foods I've been eating, why I like the program, what I've been craving, tips/tricks for staying on track and what changes I've seen since begining the program.